We've toiled for days (literally. literal toilage) to compile lists of all the games on the site that were not only the highest rated by you, our cherished readers, but also those we personally felt deserved mention. And let me tell you, there were a lot of games that were deserving; we saw a lot of new talent create amazing and memorable titles, as well as favourite familiar creators grace us with more of their high-quality work. Starting today, you'll be able to vote for your favourite games in each category from browser to casual downloads, and indie games to mobile titles, once per day. Voting runs from January 11th through January 25th, and at the end, the titles you love the most will reign supreme and be showered with love, adoration, ponies, and chimichangas. Game of the Year — Checking this box before voting on this page will also cast 1 vote for the game you choose here towards Game of the Year 2011. You may vote for one game only (each day) to be Game of the Year. 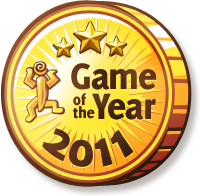 Is there a game you feel personally deserves to be recognised as the very best of all from 2011? Then start voting and spread the word! 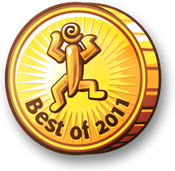 2011 was a fantastic year for creativity, with more developers than ever before making games that pushed the boundaries of their chosen genre, and some that seemed to defy neat classification altogether. To that end, trying to decide in what category to put some of these games was a bit of a nightmare, and one that was only resolved with a lot of thought, debate, and no-holds-barred cage fighting. If you find a game you believe is a different genre than the one we've placed it under, please remember that we tried our best to place them as accurately as we could, and also we love you very much. It's obvious that the developers of these great games are the heart of the site, without whom we wouldn't have jobs, but if that's true then you, dear reader, are the very soul of it. Because you keep coming back to us each day, sending us your feedback and the games you find, and creating such an amazing, good-smelling community of clever, helpful people, this is a place we're proud to be a part of. Thank you for your time, your affection, and here's to many more years to come! But hey, who cares about that, right? On to the games! "where is 2012?" is not a point and click adventure, it's a platformer puzzle. To January 25th, eh? So I can't change my vote, but I can just vote differently the next day. Yes? Well I'm sure Dora did well. @ Shudog: Yep, that's correct about voting. You only get one vote per category per day, but are free to choose a different game each day. I fight dirty. There were trained ferrets involved, and I scattered little pieces of Lego around for people to step on. I didn't like doing all that skipping (no mobile gaming from me), but I'm glad that I felt that I could vote on more games this time around! Last year made a bit of a choosing problem for me (i.e. I didn't play enough or not enough games were nominated). elle, we should have been prepared for it after Pony Mondays. The horror... the horror! Why am I sometimes sent back to the first page instead of the next category when I vote? I don't think there's a point in making a list of the categories. It's completely random. Going back and voting again a few times eventually works and takes me to the next category. @ cams: I've experienced that too, but it seems to happen when I try to vote before the page completely loads (my internet can be slow sometimes). Maybe that's what's going on for you too? If that's true, I can probably disable voting until the page loads completely. It also may be likely that votes are not getting tallied correctly if you vote before the page has loaded in its entirety. I've voted on a lot of categories and lemme say that, whoever wins, you did an AWESOME job in making so many types to fit so many different games in it. The only thing I'd not agree with would probably be DJManiax as a webtoy/sandbox, but it got my vote anyway. And of course, I'm rooting for Snailiad as GOTY! Voting is now closed. Results soon(ish*).